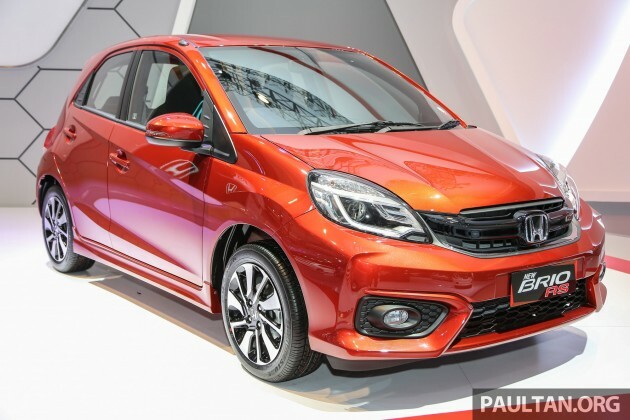 Honda has revealed the Honda Brio facelift at the 2016 Indonesia International Motor Show (IIMS). 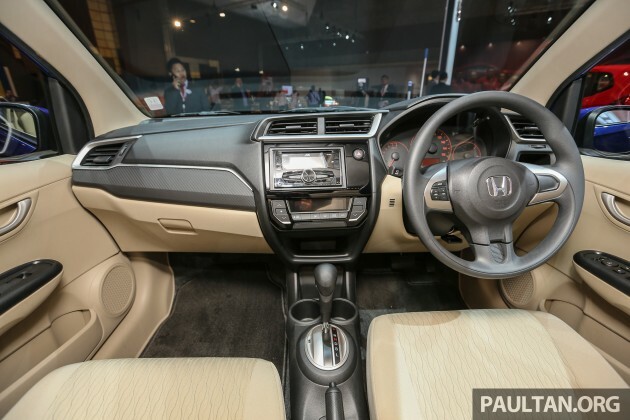 Not the biggest surprise, as we’ve already seen the refreshed face on the Indian-market Honda Amaze earlier this month, but here, it’s grafted on the original five-door Brio hatchback body. The new face is less cutesy than before, thanks to a new front bumper and grille treatment. The Brio hatch’s distinctive rear end remains the same save for a new rear lamp design. New 14-inch rims are in, and there’s a new Brio RS variant with 15-inch dual-tone rims, side skirts, projector headlamps with LED guide lights, power retractable wing mirrors with LED signals and a rear glass garnish. RS badges too, of course. Inside, it’s all new. The Brio gets a fresh dashboard in the style of the Jazz, which is significantly more contemporary and premium in appearance than the original interior with its rounded elements. There’s a new digital air con control panel and Eco indicator across the board. Non-RS (type E and S) cars get a 2-DIN JVC head unit instead of a 6.2-inch touchscreen unit. All except for the base S get steering audio buttons on the right steering spoke. The Satya E and S ship with black-beige cabins (beige seats) while the RS gets an all-black cabin with orange stitching. The latter matches the orange-like Passion Red Pearl hue that’s exclusive to the RS, as seen here. The entry-level Honda’s drivetrain has been revised. The 1.2 litre four-cylinder unit remains, but it gets a slight power bump – from 88 PS and 109 Nm to 90 PS and 110 Nm. The Euro 4 SOHC i-VTEC motor is paired to a new Earth Dreams Technology CVT automatic or a five-speed manual. The Brio is classified as a “Low Cost Green Car” in Indonesia. The Honda Brio facelift is priced from Rp. 129.6 million (RM38,397) for the Satya S M/T to Rp. 174.7 million (RM51,733) for the RS CVT. The Modulo accessories catalogue includes door visors, an exhaust pipe finisher, chrome door handle inserts, illuminated side step garnish and a chrome garnish for the wing mirrors. Good exterior looks with premium feel black-beige interior. Solid engine and transmission as well. Well done Honda, this is definitely miles ahead of the competition. Sigh, if only the Savvy or Axia were designed as good as this…. Poton can rebadge it as Satia S.
Proton already break up with Honda, Proton is now with Suzuki. So can’t rebadge Honda already. If Proton can rebadge it, ah-Lians would lik it. 2 circles and a stick..